The unfortunate fact is that much of science reporting is a morass of ideologically driven junk science, hyped research, or thick, technical jargon that almost no one can understand. So whose science news should you trust? Together with Alex Berezow at ACSH, the editors of RealClearScience have evaluated the mainstream science press. For each website, we asked: Is the science behind their stories and how it is presented very interesting, so-so, or weak? Then we asked: Is the reporting—in tone and in subject—driven by ideology or driven by facts? Some interesting notes: Science, Nature, and Ars Technica are regularly top notch. The Economist also scores highly, despite its drier coverage. The BBC offers quality coverage of major science stories almost every day. Some sites like Chemistry World and Physics World present admirably factual science reporting that often flies completely over our heads. While expert audiences may appreciate their coverage, it often leaves laypeople bewildered. Forbes and Gizmodo suffer the inverse flaw. These sites tend to feature crisp writing on exciting topics but sometimes fail to keep their ideological or hype tendencies in check. Most mainstream political and cable news sites have generally poor science reporting. This occurs both on the Right and Left. 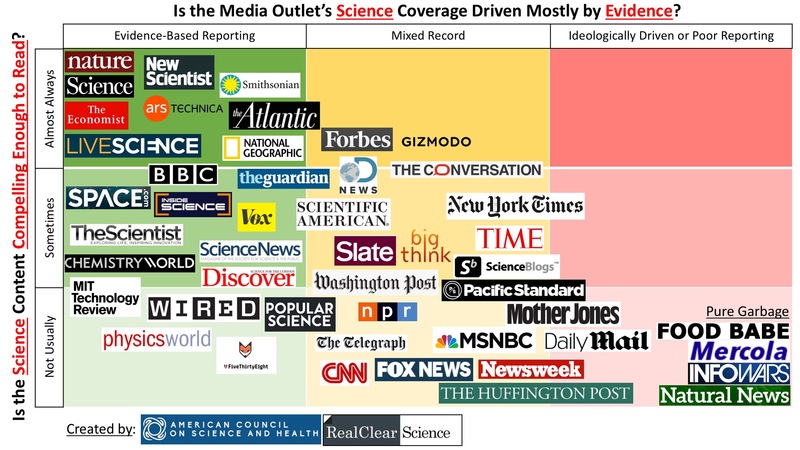 Fox, CNN, and MSNBC all score poorly on compelling science content. Big American newspapers and magazines struggle, too. The New York Times and Washington Post are often dominated by ideological garbage science such as fad diets, organic food crazes, and new age fluff. TIME and Scientific American occasionally suffer from similar ideological bias. NPR has given time to anti-vaccination advocacy. Notable bottom feeders in science include The Huffington Post, Mother Jones, INFO WARS, and Food Babe. Read these sites only if you want to reinforce your comfortable cocoon of pseudoscientific hokum. When it comes to scientific coverage, we look for two things: First, does the site present compelling coverage? Is the research timely, of good quality, and presented so that people without PhDs can understand it? Second—and increasingly important in the current age of weaponized media coverage—does it uphold factual truth as best we know it over ideological bias? Does the source cover news as it is, or news as flatters the politics of the editor? At RCS, we strive to bring you stories that can answer yes to both questions. *Sections amended 3/6 to further detail our methods and make clear that these are inherently subjective rankings. Tom Hartsfield & Ross Pomeroy are the editors of RealClearScience.